In the past, woodlands were a vital source of wood and wood products, many of which were essential for peoples' survival. 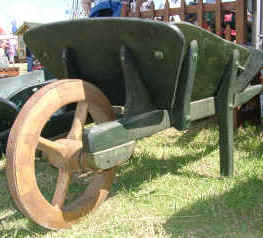 Woods would often be a focus of industry, particularly in the times before easy transport became available to move raw materials away from their point of production..
Wood had a multitude of uses. It was used as a fuel for cooking, for the production of charcoal and for smelting local ores. Bark was removed from timber and used as a source of the tannins necessary for tanning animal hides. Ash from burnt wood was used to produce potash for the glass and soap-making industries. 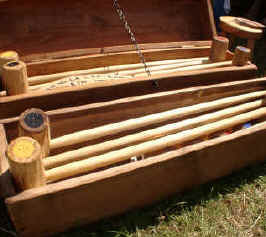 The wood itself provided vital building material for houses and ships. Much of the activity would take place within the woodland itself. Charcoal was in great demand for activities such as iron smelting. Itinerant charcoal burners would live on a woodland site for the few days which it took to complete the slow carefully controlled burn. Furniture would often be produced in woodland clearings, close to the source of the wood. Wood is still a vital product even today. Every man, woman and child in Britain uses 1 tonne of wood each year. However, with the removal of dependence on local products and the development of new materials and technology, the old traditions have increasingly faded away. Traditional wood crafts are kept alive today by a variety of craftsmen with an interest in preserving old knowledge, tools and ways of life. 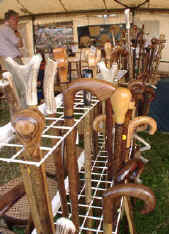 Products as varied as walking sticks, croquet sets and wheelbarrows are still produced for sale using a variety of hand tools.